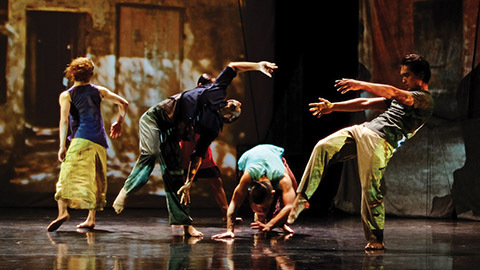 Japanese choreographer and dancer Akiko Kitamura‘s multi-media dance performance Cross Transit, which shows the history of Cambodia’s folk culture as captured by photographer Kim Hak and transformed into movement by Kitamura, will be performed on March 19 at the Kennedy Center’s Terrace Theatre. “Through Kitamura’s fieldwork, and with funding from the Japan Society, Cambodian artists who had overcome the atrocities of the country’s past came together with Japanese artists with completely different backgrounds in contemporary dance to collaborate, allowing Kitamura to gain a new perspective on the views and expressions from both sides of Japan and other Asian countries,” says the event brief. A combination of Cambodian history and Japanese art, the work incorporates various forms of approach inspired by artists such as body expression, film, and photography which explores the future of Asia, as well as relations between Japan and Cambodia. Kitamura started the Cross Transit project in 2015. Three years ago, it premiered in Tokyo, and later in Phnom Pen, Cambodia, in November 2017. Then in October 2018, the second performance in the series titled Cross transit – vox soil premiered in Yokohama, Japan. Kitamura was awarded a Fellowship Grant for Individuals by the Asian Cultural Council in 2015. TranSenses, her solo short piece, debuted at Japan Society in 2017. She is presently an associate professor of Art Communications at Shinshu University. Kim Hak is a photographer and videographer. He was born in Battambang City, Cambodia. Hak’s work has been exhibited at several art and photography festivals, including in Australia, France, Great Britain, the Netherlands, the United States, Canada, Singapore, Burma, and Cambodia, among other countries. Tickets range from $29-$39. The show starts at 7:30 p.m. You can purchase tickets here.